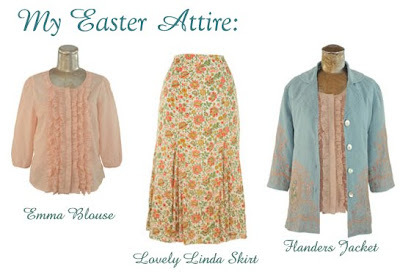 Easter brings back memories of being a little girl, one of three sisters, sitting on the front porch having a photo taken of us in new outfits. From head to toe we would be freshly outfitted, each with an Easter basket of eggs and bunnies in our hands and chocolate smiles for the camera. Easter’s in the North East can be cool some years, or delightfully warm and sunny other years. 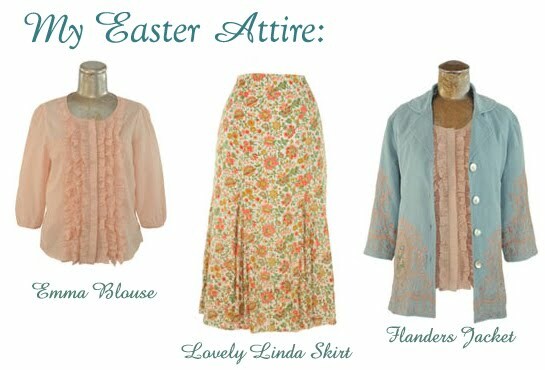 This Easter I’ll be wearing my Flanders Jacket in baby wale corduroy, a soft powdered blue, the ruffled Emma Blouse in delicate peach voile, and the Lovely Linda Skirt tossed with coral and pink flowers on self striped cotton. I think I’ll have my picture taken with three imaginary little girls- one floating like a dancer in the Posyette Dress in pretty orange, one In the Dotty Dress with playful polka dots, and one in the Fleuri Dress, a flurry of red flowers to go with her sassy smiles. Search your personal memory album for special moments, and choose something wonderful to wear for your spring wardrobe. Oh, we have a little princess that would be just precious in one of those! Every Easter, my mom would sew a new dress for her and one for me .. and they matched! We would wear an Easter hat and gloves. Some years we needed a Spring jacket .. other years no jacket was needed! I loved my mom's sewing! I love the Linda skirt! I love to see it in a table cloth too. lol I just love your tablecloths! I loved hearing your memories! 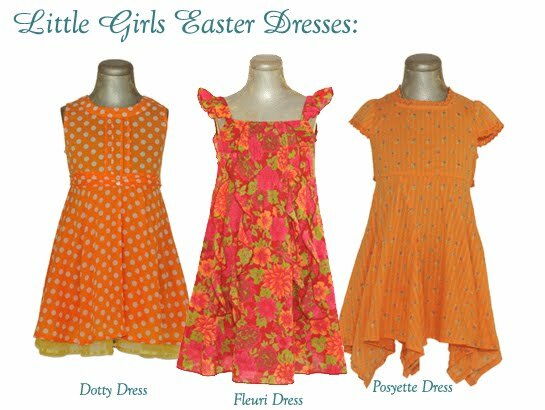 Easter was always so fun as a child, all dressed up in our Easter dresses, with egg hunting with cousins, at my grandparents! I think every child loves to dye eggs! It is still so much fun! lovely outfits..I just saw your stunning strawberry fabric over at Bill's lovely blog, Affordable Accoutrements he did an incredible job. I can't wait to add some more of your linens to my collection. Do you happen to have a store in Manchester Vermont?? ?